Jim became acquainted with George Lucas in England where he was making his Star Wars movies near to the studio where Jim taped The Muppet Show. They had obvious interests in common, and as development ramped up on The Dark Crystal in 1978, Jim’s team collaborated with Lucas’s on the creation of Yoda. They continued to stay in touch, and Jim attended the Return of The Jedi premiere in 1983. Jim was beginning to think about his next fantasy film at that point, but was also occupied with shooting The Muppets Take Manhattan, launching Fraggle Rock, and trying to sell his idea for a show called Starboppers. By the beginning of 1984, serious work began on the screenplay for Labyrinth. Jim met with David Bowie that summer, and creatures started to emerge from the London workshop. In August, Jim met with Lucas who agreed to serve as executive producer on the film. Lucas began attending script meetings and giving notes. Just before the shoot started in May 1985, Jim was asked, “How is that partnership working out? Here you’re two creative geniuses.” Jim responded, “Very nicely. We’re working on the story at this point together, and then…I’ll be directing the film and George will be doing a lot of the editing afterwards.” The film wrapped in September, and Jim showed the rough cut of his film to Lucas in San Francisco. Lucas came over to London to work on the editing and then met up with Jim again in New York to continue. By April, Labyrinth was ready for some test screenings, and on June 27, 1986, the film premiered. Learn more about the development of Yoda. 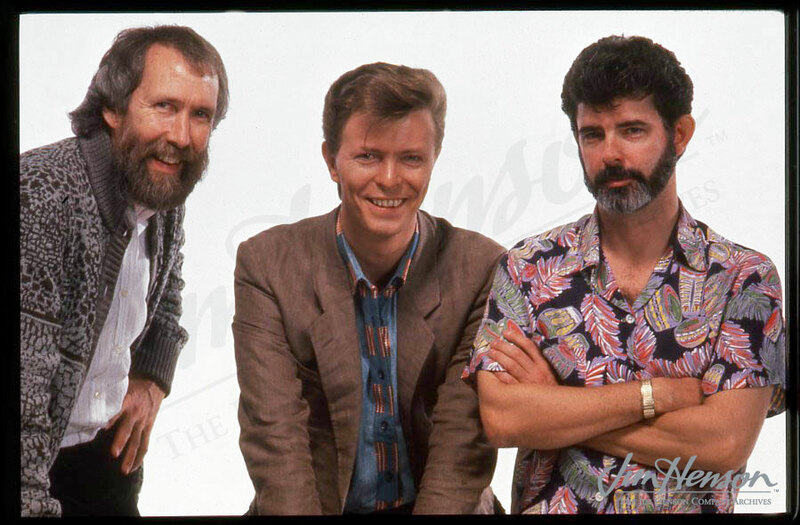 Jim, David Bowie and George Lucas, 1986. This entry was posted in 10-October '85, 1985 and tagged David Bowie, Fraggle Rock, George Lucas, Labyrinth, Return of The Jedi, Star Wars, Starboppers, The Dark Crystal, The Muppet Show, The Muppets Take Manhattan, The New York Times, Yoda. Bookmark the permalink.